Kirsty Manning grew up in northern New South Wales. She has degrees in literature and communications and worked as an editor and publishing manager in book publishing for over a decade. A country girl with wanderlust, her travels and studies have taken her through most of Europe, the east and west coasts of the United States and pockets of Asia. Kirsty's journalism and photography specialising in lifestyle and travel regularly appear in magazines, newspapers and online. In 2007, Kirsty and her husband, with two toddlers and a baby in tow, built a house in an old chestnut grove in the Macedon Ranges. Together, they planted an orchard and veggie patch, created large herbal 'walks' brimming with sage and rosemary, wove borders from chestnut branches and constructed far too many stone walls by hand. Kirsty loves cooking with her kids and has several large heirloom copper pots that do not fit anywhere easily, but are perfect for making (and occasionally burning) jams, chutneys and soups. With husband Alex Wilcox, Kirsty is a partner in the award-winning Melbourne wine bar Bellota, and the Prince Wine Store in Sydney and Melbourne. An awesome read. Totally engrossing. Highly recommended. Very enjoyable book. I liked both the frech and tasmanian stories. Delightfully written and easy to read. I enjoyed this book a lot. I have started reading some more by Kirsty Manning. 5.0 out of 5 starsThe Midsummer Garden is just the sort of book I love to read. 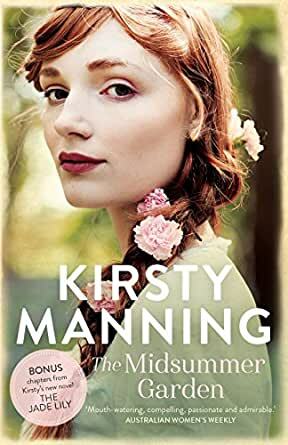 The Midsummer Garden by Kirsty Manning is just the sort of book I love to read. In 1487 Artemisia weaves her magic with culinary delights in the kitchens at Chateau de Boschaud and with her knowledge of herbalists’ lore her food is unsurpassed. In 2014 Pip Arnet is enthralled with the marine biology of the Tasmanian coastline and after the gift of copper pots from a chateau in medieval France, she sets out on a journey to discover their origin. From the Blurb: Travelling between lush gardens in France, windswept coastlines of Tasmania, to Tuscan hillsides and beyond, The Midsummer Garden lures the reader on an unforgettable culinary and botanical journey. The Midsummer Garden is an enchanting read and Kirsty Manning, who is a gardener herself, displays her love of plants and gardens. The Midsummer Garden with its beautiful cover is a story that will keep you turning the pages long after you should have turned out the lights.